I’m looking forward to voting tomorrow. My daughter and husband are particularly excited about the election, but I have hit a wave of calm. My main wish is that regardless of the winner tomorrow, American leaders will find a way to really listen to everyone in the country, and bring us all back together. The end result of this election is going to be very telling of the future of America and the world, and I hope it will all be for the better. 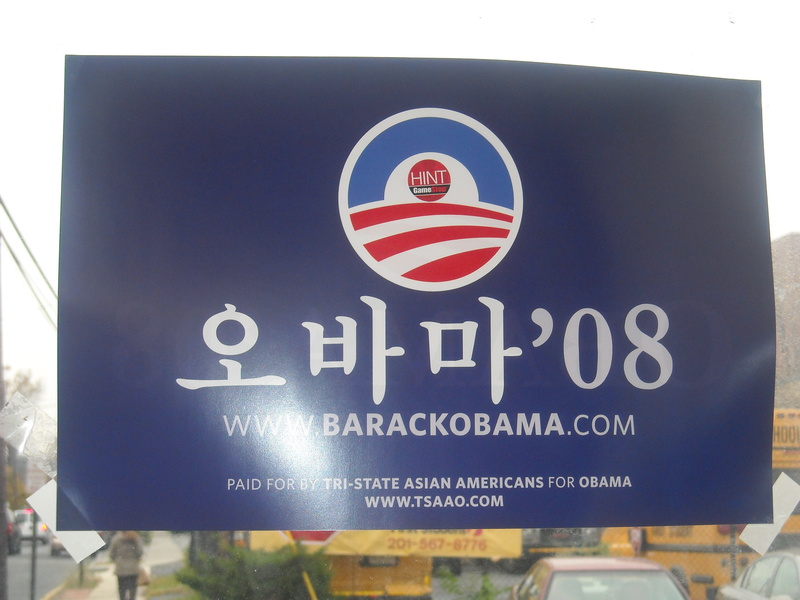 I thought the Korean Obama signs on the bus stops in Englewood this morning were cool. In addition, November is National Novel Writing Month. Inspired by “literary abandon,” I’ve decided to diligently work on my new novel and have it completed by November 30th. This does not exactly go along with the rules. You’re supposed to begin and end a new project in November, but I don’t have time for that. I really need to get cranking with work. A title for this project still eludes me. And because it’s November, and Christmas is looming on the horizon, and my knitting projects are nowhere near finished, I have a little bubble of excitement/worry in the pit of my stomach that makes me want to laugh/cry/run/sing/dance. It turns out that November is all about hope for me this year.